The “Post Academic’s Guide to the Office” series covers the secret rules of the Hamster World that no one ever told you. Most of these rules involve non-work activities, such as romance and food. The last installment covers the trickiest area of office etiquette–boozing. Some companies have strict no-liquor policies … That may be related to how the boss feels about liquor. Do not assume that it is okay to have liquor at your office parties or drink on the company dime. … while others don’t mind if you drink on the job. The three-martini lunch really does exist in a few places, but there’s a catch: You have to be able to work afterwards. No wetting yourself a la Freddy Rumsen. They really expect you to deliver, and being able to play “Eine Kleine Nachtmusik” on your fly does not count. I’ve always felt that the three-martini lunch is an endurance test. In some cases, it might be fine if it’s Friday and you have a beer when you go out for lunch, but eat food with it so you’re still functional. More after the jump! 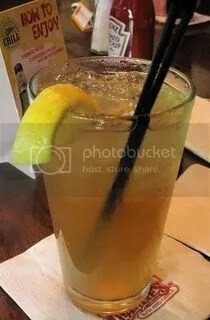 Image of a Long Island Iced Tea by rootology from Wikimedia Commons under a Creative Commons license. … and watch the beer pong. Some workplaces let you bring a keg right into the office, although this is happening less with the economic bust. That said, here’s a message for you, young Jedi: the old people are not happy when you splash them during your beer pong game. We have senses of humor and don’t mind the frat games you cling to, but don’t you dare stain my work clothes. Two-drink maximum. … or less if you feel the urge to gossip about a boss or hit on a colleague. Most likely, the coworkers you’re hanging out with are cool and will agree with you or you wouldn’t be hanging out with them in the first place. But you don’t get as much “hang out” time with your peers as you do in grad school, and it’s harder to gauge how they will react to what you have to say. A lot of people go to grad school so they don’t have to put on a professional mask. Holding a little of yourself back is the toughest part of the Hamster World, but it must be done in order to get along with so many different types of people, and booze encourages you to put too much of your personality on display. Beware the hook-up. Yes, everyone noticed that you left together, no matter how drunk they were, and you will be teased mercilessly the next day. If you don’t mind the teasing and you’re following the basic guidelines of office romance (dating within your peer group, reading the HR manual first, etc. ), then by all means have a good time.